I don’t know why, but I really like this screenshot of a bunch of fried, hard boiled eggs. So, as you know, I recently had to acquire a new phone as Peppero went and shattered his face. I stayed with the same OS with the new phone, but a completely different manufacturer. I went back to HTC, which I never planned on doing. I had several bad experiences with HTC. But Microsoft/Nokia has the weirdest business plan with their phones and they decided not to release the next gen of Peppero, the Lumia 930, in the US. I…don’t understand this reasoning at all. That meant, if I wanted to stay with the Lumia line, which I wanted to do, I would have to go down a level on my phone, which I did not want to do. I would be missing out on storage, possibly processor speed, and built in wireless charging. Going with HTC, one of the very few other manufacturers releasing phones with the Windows Phone OS for ATT, I could keep my storage and even get expandable storage and gain processor speed…but now I’m missing out on my Lumia specific apps, the really nice camera, and…built in wireless charging. And it’s not like the HTC One can ever incorporate wireless charging because it has an aluminum housing. Sugh. SUGH. Well, with the wireless charging, I’m getting around that with a wireless charging adapter. It’s a microfilm with a coil inside that outputs to a micro USB connection which you then plug into the normal charging port of your phone. So…I can still charge my phone wirelessly but I lose my USB connection. I don’t often transfer things to/from my phone with my computer, so it’s acceptable. But it was SO. CONVENIENT. to have inductive charging on my Nokia. With my Lumia specific apps…I just miss them. There’s really nothing I can do about that. One that I hadn’t realized that was Lumia specific was the call block app because they had incorporated that so well into the phone settings I thought it was just included with the OS. So…now I have to manually screen calls again. Yay. I also miss the camera more than I thought I would. HTC’s and Nokia’s (now Microsoft’s) approach to what makes a good camera has been different. Nokia tries to jam as many pixels as it can into is sensor (it occurs to me that I don’t know if camera phones use CCDs or CMOS and that I should probably look into this) and give you nice optics and various built in filtering to give you clean shots. HTC uses “ultrapixels” to help with low light scenarios, which means you can only cram so many pixels onto the sensor, and…a second lens? I haven’t really figured out this second lens thing. Something about depth? Now, it may sound like I am completely dissatisfied with Derrick (as in gallows), but I am not. It’s a really good phone. The build quality, which was a huge thing with my previouos HTCs, is really good. Great. Wonderful even. The hardware inside is also wonderful. And the screen is beautiful. It’s a really good phone, whether you prefer Android or Windows. I would definitely recommend the HTC One M8. But…I do miss the Lumia line. Anyway, about the egg. I was playing with the camera, trying to take a photo of this deep fried hard boiled egg I had gotten from a place that claims to be an Irish pub, and I had burst shot on and didn’t realize it. So I ended up with a lot of photos of this egg. 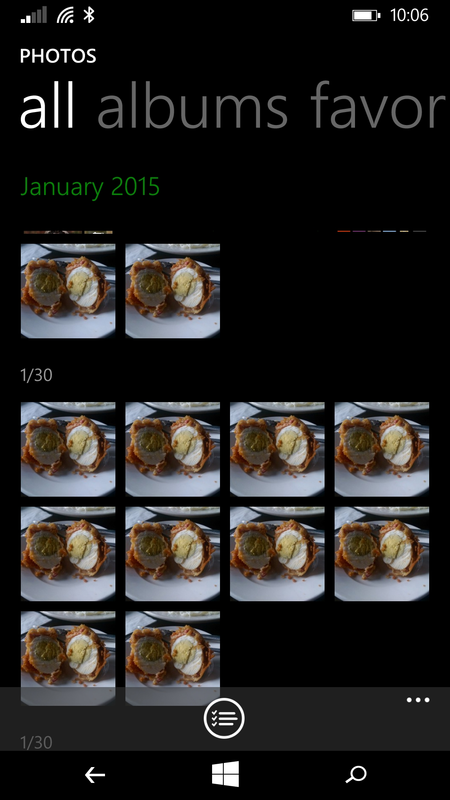 And I like the result of the tiles of photos of eggs. Probably more so than the photo of the egg itself. The end. So, a thing recently happened. This thing caused a lot of my hair to fall off. I was the sole cause to this thing. For you see, sometimes I get this overwhelming urge to play with scissors in the middle of the night. I can often fight this urge off, as overwhelming as it is. But this time it was exacerbated by the fact that I recently acquired a set of CreaClip…clips. And in case it is still unclear, this thing involved me cutting my hair. I actually don’t remember how I found out about the CreaClip. It seems that they advertise solely via infomercials. Now then, I actually like infomercials. I think they’re ridiculous and often hilarious. I just like to watch them for the hilarity of it all. I hardly ever buy anything because of an infomercial. Maybe because they’re just too ridiculous with their claims. This isn’t to say that all infomercial products are shams. We do own some infomercial products, except that we didn’t buy them through infomercials. We’ve acquired them from actual stores after they became really popular…due to their claims panning out, I guess. Now for the CreaClip, I’ve never seen one of their infomercials on TV. I don’t actually watch much TV anymore and when I do, normally it’s stuff I’ve recorded so I can skip through commercials or I just have the TV on in the background for white noise while I work on projects. I don’t actually pay attention to what’s airing during that time. And actually, if I want white noise, I normally put on a podcast. So that might be part of it. Also, I especially don’t watch much TV when infomercials are generally aired. I have seen CreaClip infomercials on YouTube though. Maybe that’s how I found out about them. Maybe I was YouTubing for ways to cut your own hair and their infomercials popped up. That seems reasonable. And that must have led me back to their site where I perused more YouTube videos of their product. And that must have also led me to look on Amazon to see if anyone else sold their product through Amazon because then there would be a chance for reviews. Also, it’s because I had no intention of paying 20$+ for some plastic with a level on it to get results I could do by just using hair ties, which I have in abundance. Which I also lose in abundance. But more so, which I break in abundance. At any rate, I ended up finding a Hong Kong seller that was selling through Amazon what ended up being the original Japanese version of the CreaClip for only 5$ with free shipping. I decided that this was a marvelous deal and that I would be willing to part with 5$ in order to get some plastic with a level built into it. And thus, a set of CreaClips were acquired. What I found: the plastic is of pretty good quality. I was half afeared that I would be getting something really flimsy (or nothing at all, seeing as how it was coming from HK and it was free shipping) that would break the moment you touched it. It’s not. It’s pretty durable. The level is solidly attached and won’t snap off when you’re moving it around. I’m actually kind of impressed with what I got for 5$. Not that I think that the material is worth much more than that. Plastic is cheap. But the idea and execution are quite good. Together, I’d think it’s worth the 20$ I see it priced at. I have also seen it priced at 39.99$. I do not think it’s worth that much. If you want one, I highly recommend that you continue shopping around if it’s being offered to you at 40$. I don’t necessarily recommend buying from sellers in HK that offer free shipping because there is a very high chance of you getting a knockoff (I got lucky) or a sense of disappointment when you realize your shipment is never going to arrive. If you can find it for a reasonable price locally, definitely go that route. Erm…this post was originally going to show how all my hair fell off, but it’s getting kind of long and I’ve only talked about the background…and gave a semi-review of the CreaClip. I guess I’ll just have to break it up and you get to see what happens when I play with scissors and a CreaClip some other time. Huzzah!